Father of Taylor Force who was murdered in a terrorist attack in Jaffa: There's no place for terrorism anywhere. 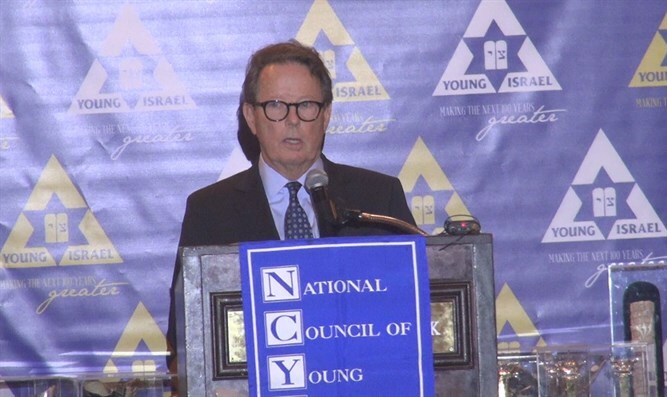 Stuart Force, father of Taylor Force who was murdered in a terrorist attack in Jaffa in March of 2016, spoke at the National Council of Young Israel's annual gala dinner. Force’s murder led to the approval in the House of Representatives of the Taylor Force Act, which would eliminate funding that directly benefits the Palestinian Authority (PA) if it continues its abhorrent practice of paying stipends to terrorists or their families. The legislation awaits Senate approval. “Somebody came up to me one time and said, ‘I’m so sorry. Your son must’ve been in the wrong place at the wrong time.’ I corrected him. I said, ‘No. He was in the right place at the right time. He was doing what he wanted to do. He was learning about Israel and the Jewish culture. The terrorist was in the wrong place at the wrong time,’” added Stuart Force. Also speaking at the gala was Sander Gerber, CEO of Hudson Bay Capital and the architect of the Taylor Force Act. The Force family “decided that they were going to take their tragedy and make something out of it. The Taylor Force Act, which is making its way through Congress, would cut off aid to the Palestinian Authority until they stop paying the terrorists and revoke the laws to kill the Jews,” continued Gerber.